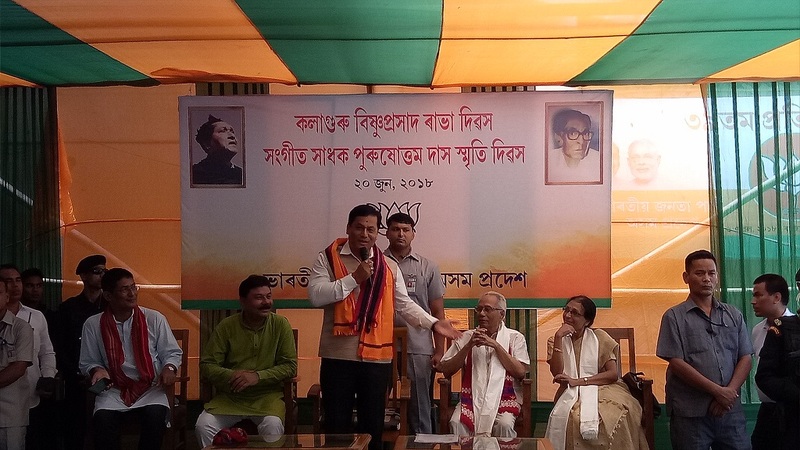 The Assam unit of Bharatiya Janta Party (BJP) observed 49th Bishnu Rabha Divas and 24th death anniversary of legendary singer Purushottam Das at its Hengrabari situated state head office in Guwahati on Wednesday. Assam Chief Minister Sarbananda Sonowal was the chief guest of the programme. Recalling the legendary Bishnu Prasad Rabha for his contribution to the greater Assamese community, Sonowal appealed to the people to contribute in establishing the Assamese community in the world platform. “If we do not work for the greater interest of the community, we will fail to establish our identity at world platform,” added Sonowal. Sonowal, on the occasion of Bishnu Rabha Divas, appealed to the BJP activists to work with dedication for nation building. 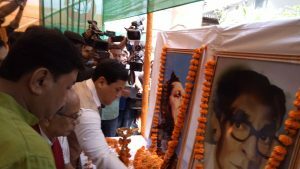 Sonowal and State BJP president Ranjeet Kr Dass also paid floral tribute to Bishnu Prasad Rabha and Purushottam Das. Noted artiste Ratna Ojha and Jonali Das, daughter of legendary artiste Purushottam Das were also present in the programme. BJP’s Lakhimpur MP Pradan Baruah was also present in the programme. Ratna Ojha was felicitated with a sarai, japi, a bouquet of flowers and cheleng sador.